Rio de Janeiro, May 3. Rejected! 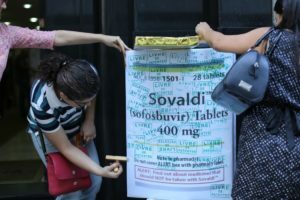 That was the decision issued on May 2nd by Brazil’s National Institute of Industrial Property (INPI) over one of Gilead’s patent applications (PI0809654-6) for the drug sofosbuvir. The drug is used to treat people living with Hepatitis C and people co-infected with HepC and HIV/Aids and has high efficiency and cure rates of 97% in Hep C cases. The Working Group on Intellectual Property of the Brazilian Network for Integration of Peoples (GTPI/Rebrip), a coalition of civil society organizations and activists coordinated by the Brazilian Interdisciplinary Aids Association (ABIA), filed several patent oppositions in this case. The decision emphasized again the “lack of descriptive sufficiency” and “inventive activity” of the patent application. “As this is a decision rather than an opinion, it should have immediate effects if Gilead were to accept it without appeals”, said Villardi. Gilead has 60 days to file a new appeal.